Indian air force pilot Abhinandan Varthaman, captured by Pakistani forces on Wednesday, has become the point of focus amid tensions between the two countries. The fighter pilot, who has 16 years of experience, is from the southern city of Chennai (formerly known as Madras). His jet was shot down in what Islamabad called a "retaliation" to India conducting air strikes in its territory. His capture was seen as a major setback for India. The government demanded his immediate release and Indian social media was full of tweets about him, with many calling him a hero and praying for his safe return. He was returned to much jubilation two days later, in what Pakistani Prime Minister Imran Khan described as a "peace gesture". Dramatic details of how he was captured in Pakistan have been revealed. "I saw the Indian flag on his parachute and knew he was Indian. I also saw his plane get hit and saw him float down," Mohammad Razzaq Chaudhry, a resident of Bhimber district in Pakistani-administered Kashmir who witnessed the moment the jet was shot down on Wednesday, told BBC's Ilyas Khan. He added that locals rushed to the fallen pilot and that he was "afraid" that they might harm him. Mr Chaudhry said that some of the men were angry and attacked the pilot while others tried to stop them. "I told them not to harm him - to leave him alone until the army comes." Local media in India reported that crowds began thronging his family home soon after news of his capture spread. The Hindustan Times newspaper quoted one of his relatives as saying that they wanted the government to "secure his release" without delay. His family has refused to comment about his capture. The son of a decorated former fighter pilot, Wing Cdr Abhinandan was first commissioned as a fighter pilot in 2004. His mother is a doctor. He is reported to be in his mid-30s. His father, Air Marshal Simhakutty Varthaman, worked with decorated Tamil film maker Mani Ratnam, acting as an adviser for his 2017 film, Kaatru Veliyidai, which was set against the backdrop of the 1999 Kargil conflict between India and Pakistan. Mr Varthaman was the air marshal at the time. The Kargil conflict was the last time an Indian solider was captured and held by Pakistani forces. Group Captain K Nachiketa, who was also an air force pilot, was in Pakistan's custody for eight days after his jet crashed in their territory. He is now retired and lives in the southern city of Hyderabad. "He [Wing Cdr Abhinandan] should be treated appropriately as an officer and sent back to India," Group Captain Nachiketa told BBC Telugu. "He is brave and courageous and we are all proud of him." He added that he did not want to talk about his capture but said that "all officers are trained for this and I am sure he will be with us shortly and join his unit again soon." A clip of his appearance on a local television show - NDTV Good Times - in 2011 is also being circulated widely. In it, he is heard joking about how you need a "bad attitude" to be a successful fighter pilot. He also talks about how you trust your colleagues with your life, referring to "blind faith" in your co-pilot when you're in the air. India had initially said that all of its pilots were accounted for, contradicting Pakistani claims that they had captured a pilot. However Pakistan's information ministry then released - and later deleted - a video showing the pilot blindfolded and with blood on his face. This prompted a furious Delhi to summon Islamabad's deputy high commissioner and condemn what it called the "vulgar display of an injured personnel". 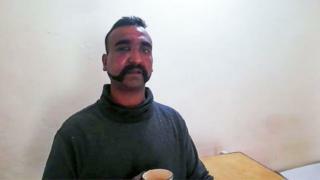 In later footage, Wing Commander Abhinandan could be seen sipping tea from a cup without a blindfold. He appeared to have been cleaned up. He said his name, military position and that he was from "down south", but refused to share any details when asked about his mission: "I'm not supposed to tell you that." In what appeared to be an edited statement aired on Pakistan TV minutes before he was handed over, the wing commander praised the Pakistani army, adding he saw potential for peace. The wing commander also criticised the Indian press, saying they always exaggerate and say a lot of damaging things that mislead people.